I’m from York, and I don’t go back as often as I should – life gets in the way and all of a sudden you find it’s over six months since you last visited. 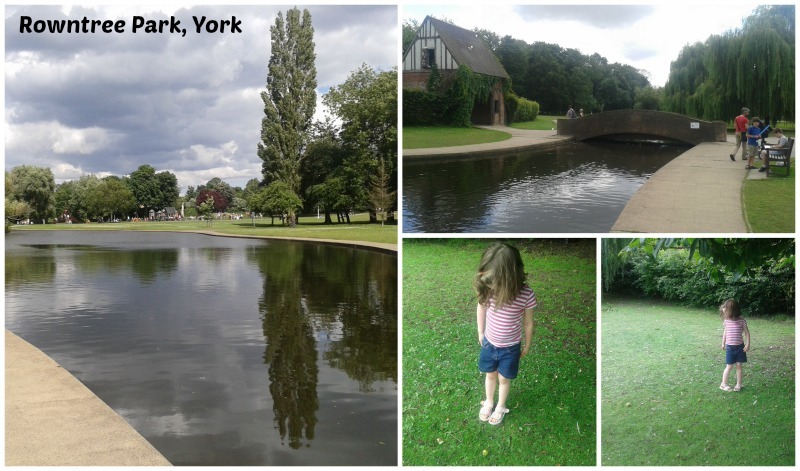 We went back this weekend just gone and had a great time – and on Saturday took H and her cousin G for a walk to Rowntree Park near where my sister lives. 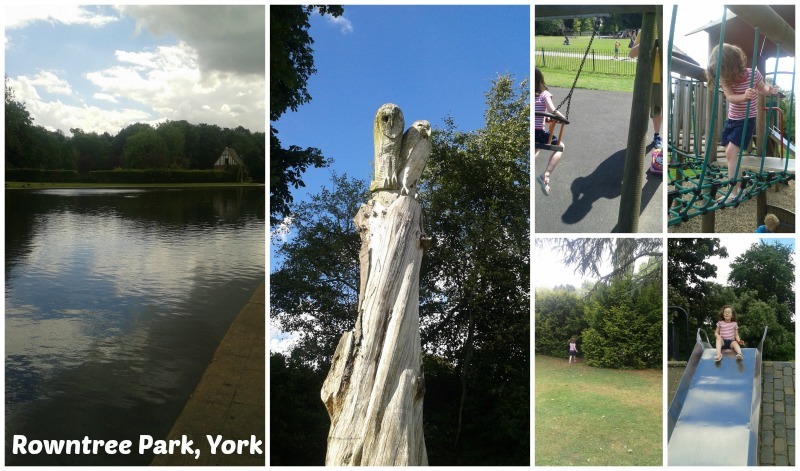 Not being from that side of York I never knew the park really well, but I knew it – where it is, that kind of thing. From past visits we know it’s child-friendly with plenty for kids to do, as well as the large pond in it (which has plenty of bird poo around it, pretty grim!). There’s a sectioned off children’s area which was perfect for a five and a three-year old (and just right for a seven week old as there was shade too) so we let them get on with it. H was surprised, standing still a conker dropped at her feet (you can almost see it above). I felt like it was a bit early, but I’m not complaining. She wanted to know what the spiky ball was. It gets even more exciting when your cousin shows you all his secret dens (even if you can’t keep up) while Shaun panics H is lost (she was fine), sitting down for some lunch in their cafe and relaxing, then wandering around the fifteen acres of park, barely covering any of it (yet still walking around a lot). Watching children play on the climbing frame, just the right size for two children who want to play ‘Ninjago’ in real life where Aunties and Mummies have to ‘get’ them (and do) while they run around excitedly screaming. A giant slide which you can race down on, and a slippy walk back up when you really don’t want to use steps but want to challenge yourself. Looks gorgeous, I love proper parks in towns – and as we don’t have a garden, we use ours a lot! What a gorgeous looking park (I can’t see any poo in the photos). How great that the park was so empty and they could run around such a large area, explore and play in dens and equipment – a perfect outdoor adventure – thanks for sharing with Country Kids.